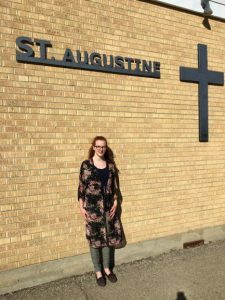 Here I have summarized some of my experiences during my first placement at St Augustine Elementary School in Wilcox, SK. My first day was very busy and full of new experiences. There are three classrooms, one library, one gym, and a staff room. Each classroom is homeroom for three split-classes. I began to get to know my learners during story time. I noticed how each student sat on the carpet. Some listened intently, some fidgeted, some kept raising their hands to talk about the story. It was interesting to notice the different behavior by age as well. The kindergarteners acted very different from the grade 2s and I noticed the older students helping the younger ones. I got to know the relationship between the school and community. Parents are welcome to join gospel assemblies so there were a few parents to help us start our day. 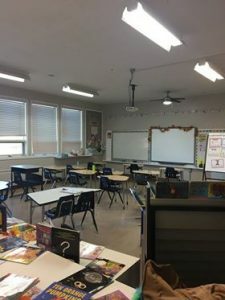 The kind of close connections I saw between the teachers and parents stood out to me. My cooperating teacher is also the principal and she really is the voice and face of St Augustine Elementary School. I was very fortunate to join the students at St Augustine at their potluck turkey dinner where I got to know the members of the SCC. Community and parent involvement is a huge thing at this school. I’ve noticed it since day one. The teachers send all the student’s home with work to be completed with their families quite frequently. This is an excellent learning tool that I think many teachers don’t utilize. This month the students were given an assignment titled “why my school rocks” to be completed at home. Each time I enter the school I see the finished pictures that the students bring back at their own pace. Its so nice to see how many parents sign their names along with the student’s names. I was able to observe the ways in which teachers build and share their knowledge. I noticed how my cooperating teachers make connections when introducing a new topic. Connections that help the students activate their prior knowledge. I think this is an important method in transferring knowledge because it helps them build confidence in their learning. I spent two placement days focusing on inclusive education. I wrote mostly about inclusion because there isn’t much cultural diversity in the small town of Wilcox. One of the teachers offers a morning active workout session for students and I am often surprised at how many students come to school early to attend this. I know I wouldn’t be so eager! They also organize reading buddy activities to get the older and younger students working together. An older student paired with a younger student would choose a book and complete a number of activities that go along with the story. Their final project was to decorate an actual pumpkin with paints and other art supplies to correspond with their chosen story. I was very impressed with the finished projects. I have noticed that some of the kindergartens have had trouble adjusting to school but the older students in the classroom are quite sympathetic to this since they remember being in their position 1 or 2 years ago. I love watching how the students interact and work together and share knowledge in the classroom. I see these encounters reflected in the schools ‘Caught Being Kind’ initiative. A student will write a kindness they witnessed from another student on a slip of paper and put it in the collection box. My cooperating teacher reads them out during assemblies.